For my Birthday a month or so ago I received a very thoughtful gift from Lonecow. 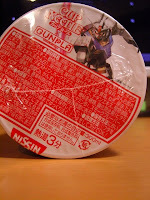 He got me the full set of Limited edition 30th Anniversary Gundam Unicorn Cup Noodles. 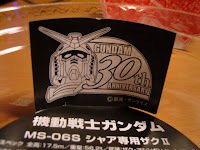 Each Cup has a special cap that includes one limited edition Mini Gundam Model. Over the last month I've been back and forth as to whether to actually open one and assemble the toy. As a reformed toy collector, who still has an entire box of unopened X-Men toys, It pains me to open anything that could one day be a collectible. But lets be honest here. The only place this thing is valuable is at Anime-Cons and Japan. Since I don't intend to sell It's all good. 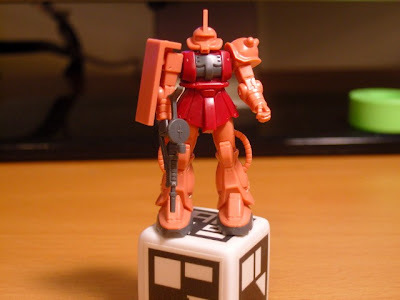 I decided that I would open the MS-06S Char Special, aka The Red Comet. 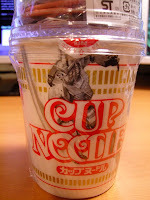 The Top of the Cup Noodle Featuring the a small picture of RX-79 Gundam. 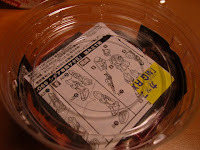 Plastic Cap containing all of the parts and the Instructions. There were three part trees, with 3different Injection colors. 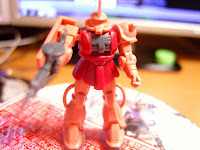 Zaku Pink, Maroon, and Dark Grey. 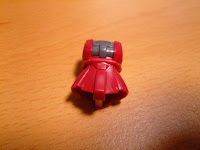 The part break down was Pink for arms legs and head, Maroon for the Body, and Dark Grey for the Foot Pads, Gun, and Chest Crest. Here is a close up of the assembled Torso. Low Fidelity in terms of detail of course, but fairly good quality all things considered. All Finished... I hope ARis doesn't mind sharing her cube. 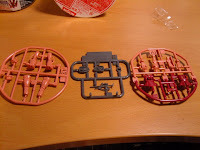 This next year I will be making reviews of Gundam Kits a more regular feature.